Very fast trains are a good option for modern rapid transit as they have lower carbon emissions per passenger trip than either road or air transport. Countries with very fast train networks include France, Japan, Italy, Germany, Taiwain, China, Korea and Spain. The United States has one high speed rail line that links Washington, D.C. and Boston via New York City. The Maglev train in Shanghai has a top operational speed 431 km/h, but this type of train is much more expensive than the electrical TGV in France which runs on high speed rails. Australia has no very fast trains and no current plans to build any despite numerous investigations and some attempts to commence building one. While Australia generally has a low overall population density, Melbourne and Sydney have almost half the total population. The air link between them is rated as the fourth busiest in the world. In 2007 there were 851 flights per week between the two biggest cities in Australia. This would be a good candidate for a very fast train service, particularly if it serviced Canberra too. The French TGV operates commercially at a top speed of 320 km/h. The distance by road between Melbourne and Sydney is 963 km. That makes a journey by TGV between the two cities just over three hours, without allowing for acceleration and deceleration. Such a train could easily compete with airlines on this route because of convenience. You could get on at Spencer Street Station, Melbourne, and three hours later you get off at Central Station, Sydney. This would eliminate the current inconvenience of getting to and from airports. Both these stations are well served by public transport to elsewhere each city. Trains are also much more spacious and comfortable than planes. High speed rail also has the benefit of significant reductions in greenhouse gas emissions compared to air travel. An Australian high speed rail network could also be extended to Brisbane and Adelaide. To date, no accurate cost estimates for a high speed train line between Melbourne and Sydney are available. 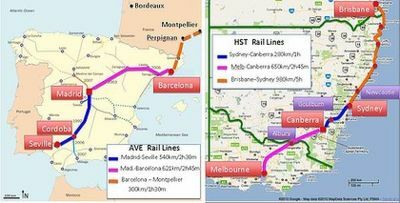 Comparing current US estimates for the 161 kilometre High Speed Train line between Orlando and Tampa in Florida ($1.5 billion or the worst-case cost put forward by opponents, $2.5 billion) would price the Sydney-Canberra-Melbourne line of 935 kilometres in the range of $A9.7 to $16.1 billion. This page was last modified 22:57, 28 March 2010.